Halloween is a time for creepy costumes, parties with friends and unfortunately - those tempting sugary treats!! Treating yourself to a chocolate bar isn't going to hurt you but trying to control those overindulging candy cravings during an event like Halloween can be really tricky. Halloween isn't celebrated as much here in Australia as it is in other countries but for those who do celebrate it, here are some healthy treats for you to try this year! Using a sharp knife cut the top of the oranges off, then scoop out the flesh using a spoon. You can cut this up to later use in your fruit salad. 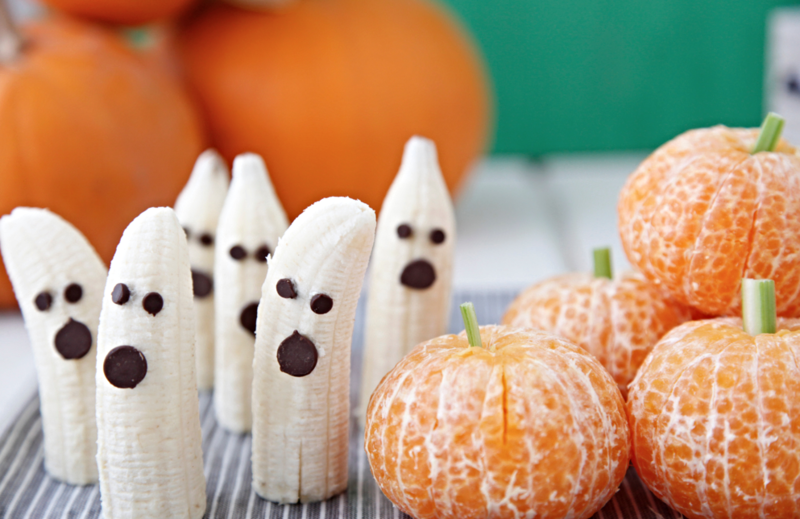 With the same knife carefully cut out pumpkin faces on your oranges, be as creative as you like! Mix all the fruit in a bowl and divide evenly among oranges. Cut two slits into one of the apple quarters and remove the flesh, big enough to fit the almond “teeth” into. Stuff the opening with 1 tbs peanut butter and arrange the blanched almonds to look like teeth. Repeat with remaining apple quarters. Cut the bananas in half. Spread a little peanut butter on the choc chips and place on the top half of the bananas in the shape of a eyes and a mouth. Repeat with remaining banana halves. Peel the mandarins. Cut the celery into little stalks and insert into the mandarins to resemble pumpkins! Slice one end off each kiwi, so the kiwi sits upright and flat. Beginning at the cut end of the kiwi, use a vegetable peeler to remove some of the kiwi’s fuzzy skin. As you get toward the top of the kiwi, pull the skin away in little jagged bits so that the skin remaining at the top of the kiwi will look like messy Frankenstein hair. For the mouth: Break a pretzel stick into a small piece and gently push that piece lengthwise into your kiwi. For the bolts: Break another pretzel stick so you have two end pieces. Shove those into your kiwi (broken end first) low on each side of your kiwi. For the eyes: Use two chocolate chips or two dried wild blueberries for eyes, gently pushing each into position.